1). Prepare soft and pliable dough (like chapathi dough) using the ingredients mentioned above. Let it rest until you prepare the broccoli filling. Remove the florets and blanch. Soak the florets in boiling water with salt for 5 minutes. Drain the water completely and finely chop* the florets and keep aside. 2). Heat oil in a pan, add cumin and let it splutter. Then add chopped ginger and garlic, saute. Add chopped onions and salt, saute till onions turn translucent. 3). Add chilli powder, turmeric powder, garam masala, along with chopped broccoli and combine. Cook covered in medium flame till the broccoli becomes soft (2 minutes). Switch off the flame and let it cool. 4). Make equal sized balls from the prepared dough and roll it to a medium thick circle. Place the filling in the middle and gather the dough from all the sides and seal. Pinch out if there is any extra dough. Gently roll it to medium sized parathas. Dust flour if needed. 5). Heat tawa in a medium flame, and place the rolled paratha. Drizzle oil or butter, when you see bubbles. Cook on both sides untill brown specs appear. 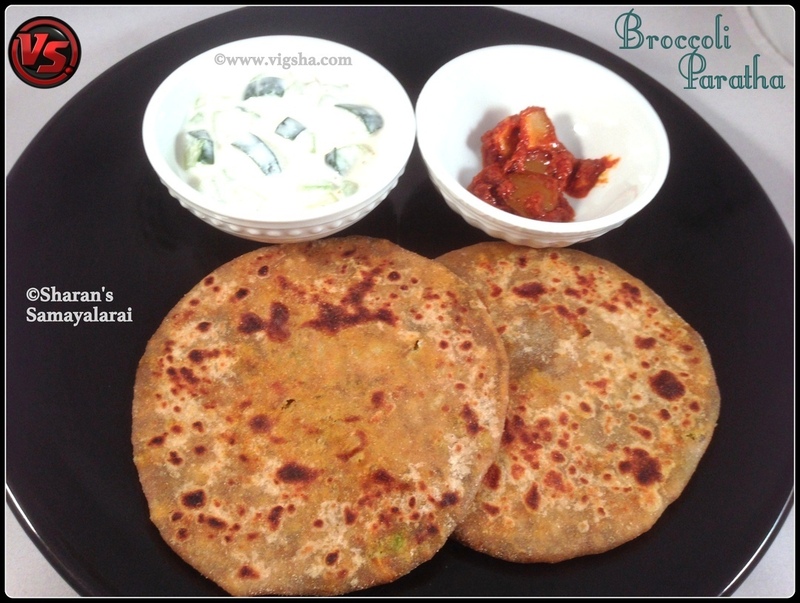 Paratha will lightly puff up as shown in the pic. Enjoy this nutritious paratha with Raita. I served it with cucumber raita and mango pickle. When packing for lunch box, wrap it in an aluminum foil to retain its softness. #* You can also use food processor or grate the broccoli. # For no onion-garlic version, remove garlic and onions and proceed it in the same way. # Make sure to roll gently after keeping the stuffing, if not stuffing may ooze out. 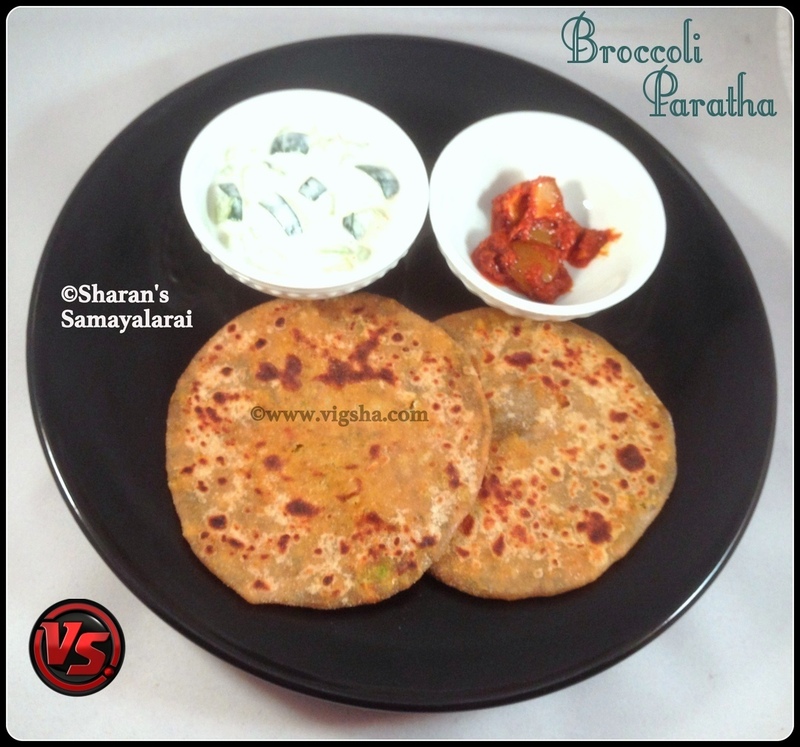 # Finely chop all the ingredients used otherwise it will be difficult to roll the parathas. # Do not over cook the broccoli.